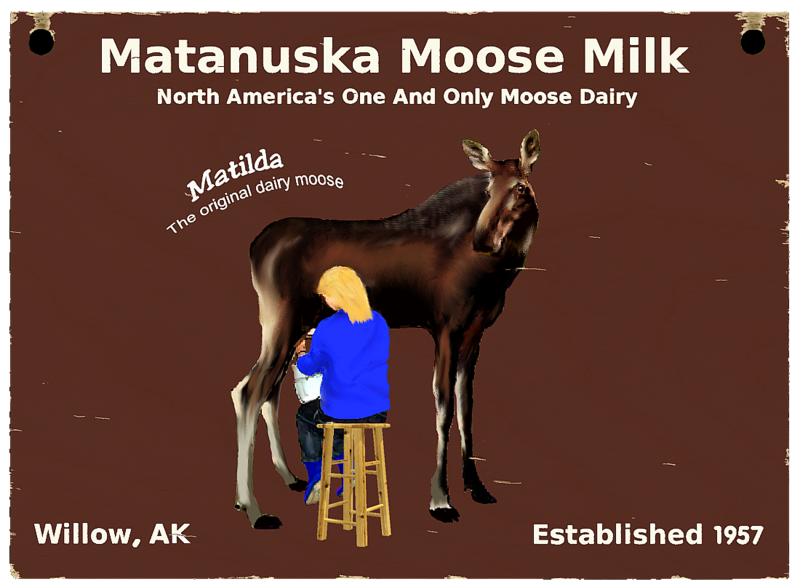 There are some people in Alaska who would like for the state to become an independent nation. And there are a few who seem to think Alaska is already independent. 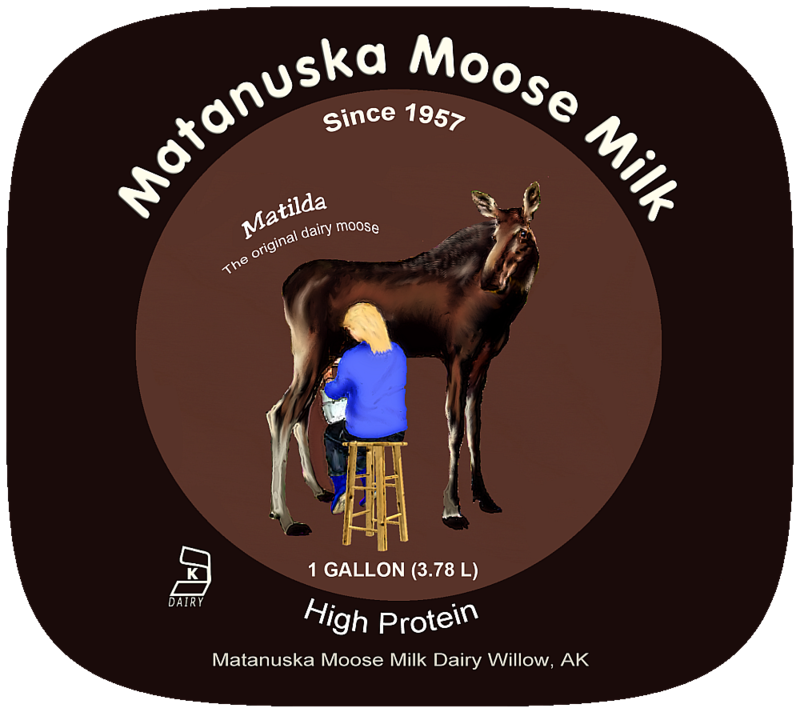 So, I have another entry in the series of postage stamps for an independent Alaska. 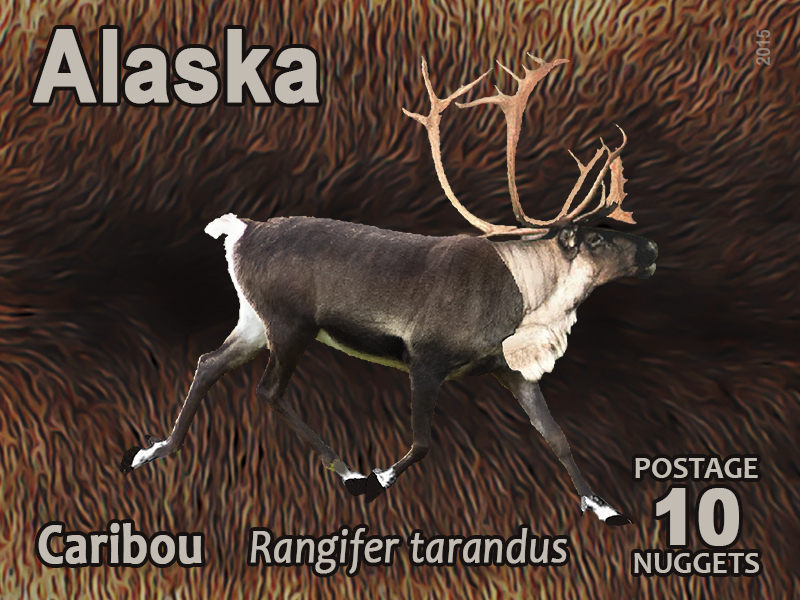 This time a 10-Nugget featuring a bull Caribou superimposed on a Caribou pelt. While Caribou (Rangifer tarandus), known as the reindeer outside of North America, are widespread and numerous, some subspecies are rare and one has gone extinct. The Inuit word tuktu means – deer that never stops moving. Caribou are always on the move, going north to calve, heading for the winter grounds, and south in the summer. Caribou considerably in colour and size. Uniquely among deer, both genders grow antlers, though these are larger in the males and there are a few populations where females lack them completely. 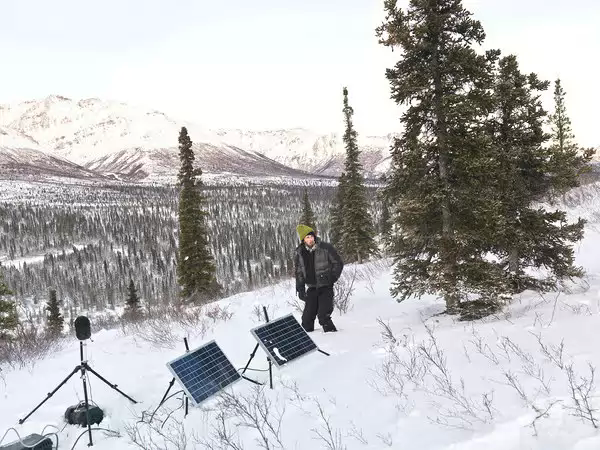 Caribou hunting and herding of semi-domesticated reindeer (for meat, hides, antlers, milk and transportation) are important to several Arctic and Subarctic peoples. Even far outside its range, the caribou/reindeer is well known due to the myth, probably originating in early 19th century America, in which Santa Claus’s sleigh is pulled by flying reindeer. In Lapland (aka Samiland) reindeer pull a pulks, a type of sled or sleigh. Caribou are present in both tundra and taiga (boreal forest) areas. It was originally was found in Scandinavia, eastern Europe, Russia, Mongolia, and northern China north of the 50th latitude. In North America, it was found in Canada, Alaska, and the northern conterminous USA from Washington to Maine. In the 19th century, it was apparently still present in southern Idaho. 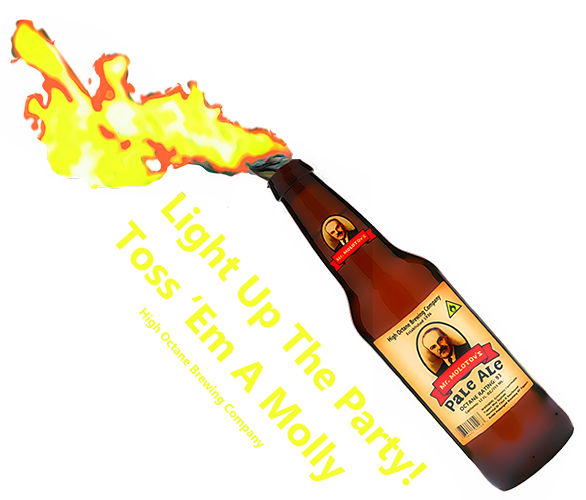 It also occurred naturally on Sakhalin, Greenland, and probably even in historical times in Ireland. During the late Pleistocene era, reindeer were found as far south as Nevada and Tennessee in North America and Spain in Europe. Domesticated reindeer are mostly found in northern Fennoscandia and Russia, with a herd of approximately 150-170 reindeer living around the Cairngorms region in Scotland. The last remaining wild tundra reindeer in Europe are found in portions of southern Norway. A few reindeer from Norway were introduced to the South Atlantic island of South Georgia in the beginning of the 20th century. Today, there are two distinct herds still thriving there, permanently separated by glaciers. Their total numbers are no more than a few thousand. The flag and the coat of arms of the territory contain an image of a reindeer. Around 4000 reindeer have been introduced into the French sub-Antarctic archipelago of Kerguelen Islands. East Iceland has a small herd of about 2500–3000 animals. Caribou and reindeer numbers have fluctuated historically, but many herds are in decline across their range. This global decline is linked to climate change for northern, migratory caribou and reindeer herds and industrial disturbance of caribou habitat for sedentary, non-migratory herds. Fur Fur color varies considerably, both individually, and depending on season and subspecies. Northern populations, which usually are relatively small, are whiter, while southern populations, which typically are relatively large, are darker. This can be seen well in North America, where the northermost subspecies, the Peary Caribou, is the whitest and smallest subspecies of the continent, while the southermost subspecies, the Woodland Caribou, is the darkest and largest. The coat has two layers of fur, a dense woolly undercoat and longer-haired overcoat consisting of hollow, air-filled hairs. In most populations both sexes grow antlers, which (in the Scandinavian variety) for old males fall off in December, for young males in the early spring, and for females in the summer. The antlers typically have two separate groups of points, a lower and upper. Caribou have the largest antlers relative to body size among deer, but the antlers of the domesticated reindeer antlers tend to be rather small and spindly. Caribou are primarily dependent on lichens for food during the winter, especially reindeer moss. They also consume the leaves of willows and birches, as well as sedges and grasses. There is some evidence to suggest that on occasion, they will also feed on lemmings, arctic char, and bird eggs. Reindeer herded by the Chukchis have been known to eat mushrooms. Some populations of North American caribou the longest migration route of any terrestrial mammal, traveling up to 3,100 mi (5,000 km) a year, and covering 390,000 sq mi 1,000,000 km2 (1,000,000 km2). 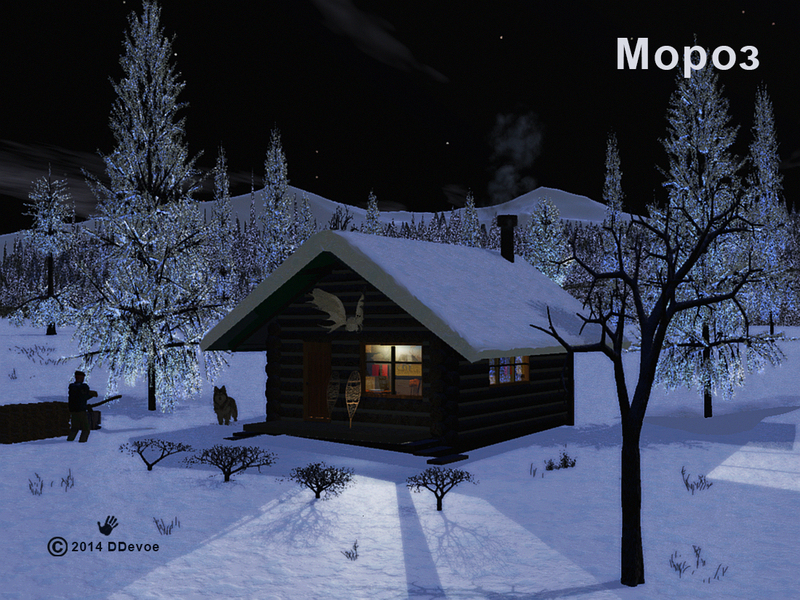 There are a variety of predators that prey heavily on reindeer. Golden Eagles prey on calves and are the most prolific hunter on calving grounds. 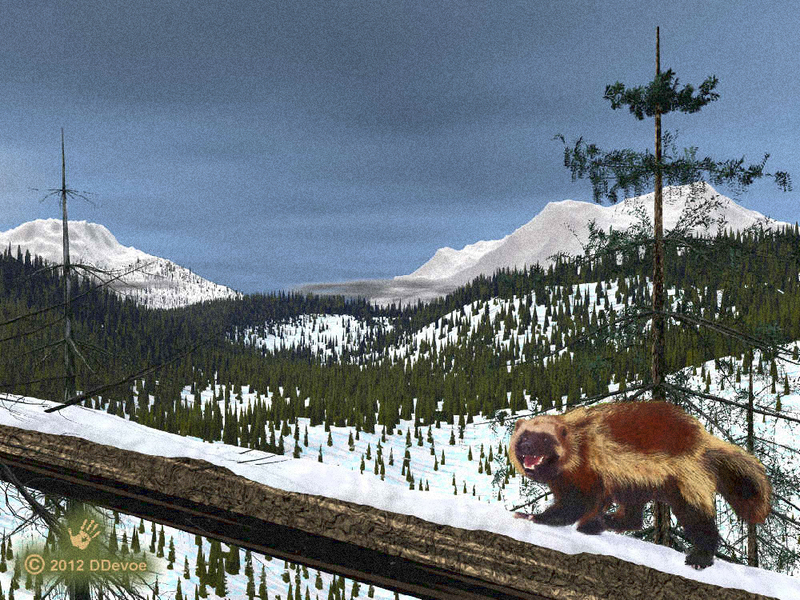 Wolverine will take newborn calves or birthing cows, as well as (less commonly) infirm adults. Brown Bear and, occasionally, Polar Bear prey on reindeer of all ages but (as with the wolverine) are most likely to attack weaker animals such as calves and sick deer. The Gray Wolf is the most effective natural predator of adult reindeer, especially during the winter. Blood-sucking insects, such as black flies and mosquitoes, are a plague to reindeer during the summer and can cause enough stress to inhibit feeding and calving behaviors. Caribou and Reindeer have long been hunted by humans since the Mesolithic and Neolithic periods, and are today the main predator in many areas. Norway and Greenland have unbroken traditions of hunting wild reindeer from the ice age until the present day. In the non-forested mountains of central Norway it is still possible to find remains of stone-built trapping pits, guiding fences, and bow rests, built especially for hunting reindeer. Caribou are still hunted in North America and Greenland. 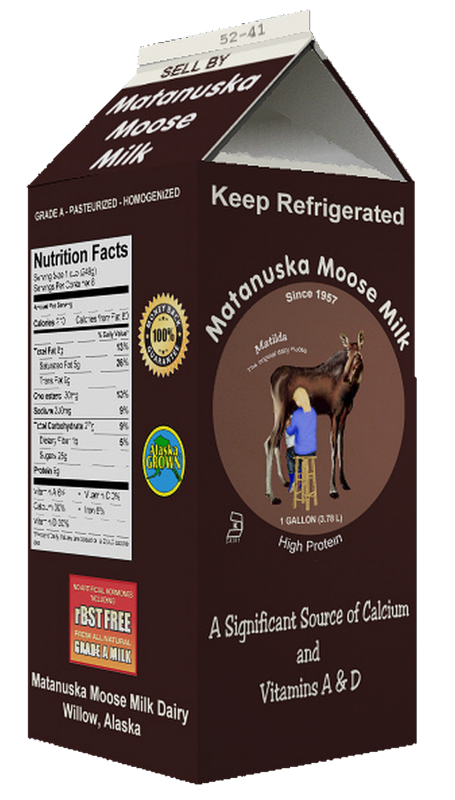 In the traditional lifestyle of the Inuit people, Northern First Nations people, Alaska Natives, and the Kalaallit of Greenland, the caribou is an important source of food, clothing, shelter, and tools. Many Gwichʼin people, who depend on the Porcupine caribou, still follow traditional caribou management practices that include a prohibition against selling caribou meat and limits on the number of caribou to be taken per hunting trip. A faux propaganda image featuring a rural scene from the early post-war Soviet Union. 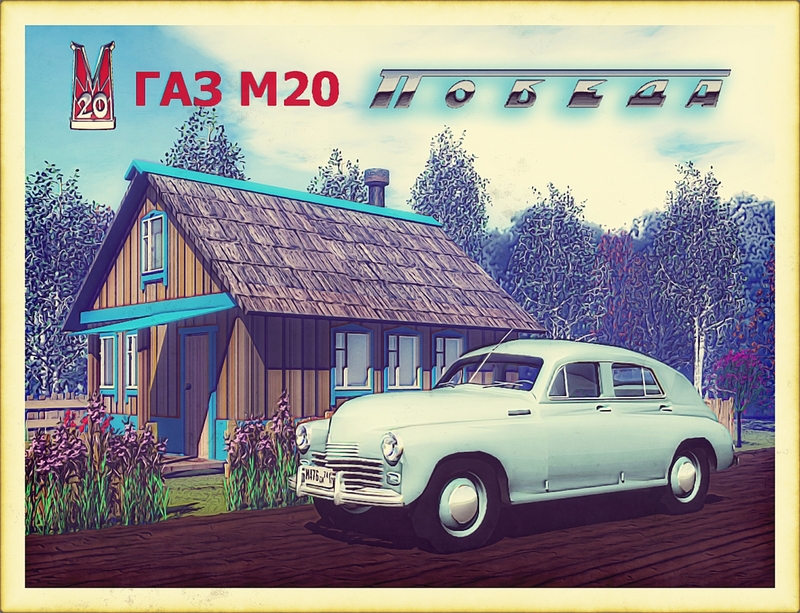 Depicts a GAZ M-20 Pobeda automobile, in front of a dacha (rural summer house). Across the upper part of the image is an “M20” hood ornament, Cyrillic (Russian) text reading “ГАЗ” (GAZ) and a side ornament found on the vehicles featuring stylized Cyrillic text reading “Победа” (Pobeda). The image has been “aged” to suggest that it dates from the early post-war period. Internal Soviet propaganda often tried to inform the people how good life was in the USSR. A dacha and a car to get there signified the good life. City dwellers dreamed of having a small plot of land outside the city to flee to on summer weekends, away from the heat and dirt of the city. The Pobeda, was the first automobile manufactured for the public after the end of World War. The M20 was produced 1946 to 1958. GAZ (ГАЗ is a Russian acronym for Gorkovsky Avtomobilny Zavod – Gorsky Automobile Factory) Pobeda (Победа) is the Russian word for victory. The name was chosen because the car was first tested in 1943 when an Allied victory in World War II began to appear likely.The Pobeda was manufactured under license in Poland and a few were assembled in North Korea. The Pobeda was the first post-war Soviet-made automobile and the first Soviet vehicle to have turn signals, two electric wipers, an electric heater, and a built-in AM radio. The car came to be a symbol of postwar Soviet life and is today a popular collector’s item. A total of 235,997 Pobedas were produced. A number of M20s have been extensively customized in recent years. There are even a few “muscle car” versions on the road. The word “dacha” originated in the 17th century from the verb “davat’” (to give), in reference to plots of land distributed by the Tsar. At the beginning of the 18th century during the reign of Peter the Great dachas became popular as summer holiday retreats. The nobility used their dachas for social and cultural gatherings, including masquerade balls and fireworks displays. By the end of the 19th century, a house in the country was one of the necessary possessions of the rich as well as the middle class. Russian poets and playwrights (including Alexander Pushkin and Anton Chekhov) mentioned dachas in their works. Summer homes in beautifully adorned areas became a “place-to-be” for many Russian artists. Many types of goods were specially manufactured for dacha use – from lady’s accessories such as fans and hat to furniture items and even toilets. After the 1917 Russian Revolution some dachas became “holiday homes” for workers. Dachas became very popular after the end of World War. For some it was not just a weekend getaway. A dacha with a small plot of land let people save their tiny incomes. Here they could plant their own vegetables. They stored potatoes in cellars, pickled cucumbers and made jams out of apples and pears in order to have some food reserves to last through the cold Russian winter. Some people grew fruits and vegetables not only for their own consumption, but to sell as well. In many areas the plots of land for dachas were limited to 0.06 hectares (about .15 acres). A plot of that size was too small for most people to live on permanently; authorities needed to keep workers in the big cities and were not interested in the restoration of private farming on a wider scale. The concession of the “zero point zero six of a hectare” was necessary because the country could not provide its people with enough food. As a result many dacha settlements sprang up with small houses standing right next to each another. There were legal size restrictions for dacha houses. They had to have not more than 25 m² (269 square feet) of living area and be only one storey tall. That’s why they usually had a Mansard roof with a small second storey room, which was considered by authorities as just a big garret or attic, not a second storey. Dachas built since the dissolution of the Soviet Union tend to be rather larger. A typical plot of land was surrounded by berry trees and shrubs. There was a small house (in many cases – with no conveniences at all) and a hut for storing garden tools. Around the house there were rows of plants and vegetables. In the areas around Moscow potatoes, tomatoes, and cucumbers were the main crops. However, the owners’ fantasies about what to plant knew no boundaries. A row of strawberries became “a must” for many (strawberries usually ripen faster than everything else). In the south beans and even melons were grown, while in Siberia many dacha lovers liked to plant sakura (Japanese cherries). At the beginning of the 1960s the number of fruit trees that could be planted was heavily regulated by the rules of the dacha settlement. The aim of this measure was to make the area visually pleasing. Later all these quotas were lifted. The same was true for the size of the plot – if you wanted a bigger plot you could simply buy your neighbor’s land or find another plot somewhere else. In the 1980s, due to the shortage of goods in stores, farming at dachas became a massive phenomenon. For some it was more necessity then pleasure, as modern farming tools were not readily available. But others took their dacha trials as a hobby. They took pride in inventing something unique for their flowers and vegetables, such as greenhouses or unique water-spraying devices. Still others tried to think of ways to fertilize the ground not just with manure, but other additives. Many unnecessary items from city apartments could easily be turned into useful gadgets for the dacha. For example, if you had too many empty cola bottles you could cut them in half and use the bottom part to protect young plants from cold spring nights. The harvest was a special pride for many people – some sold their produce, while others gave it away to their neighbors and friends. It was common to share the seeds of rare plants with others. Real fans think about their dacha all year long. In winter they plant tomato, cucumber, pepper and eggplant seeds in small pots that they keep on the window sills of their apartments – and at the beginning of May they re-plant them at their dachas. Many dacha lovers chose to live on their plots of land. They built good houses with all the necessary facilities, including heating and electrical systems. Having a banya (a small bath house) at your dacha is not a luxury any more. At the beginning of 1990s some Russian “nouveau riches” made “fortresses” out of their dachas. A few even bred exotic animals – like iguanas and crocodiles. It is said that the dacha is a way of “returning to paradise lost” – a source of temporary harmony away from the hustle and bustle of the big city. 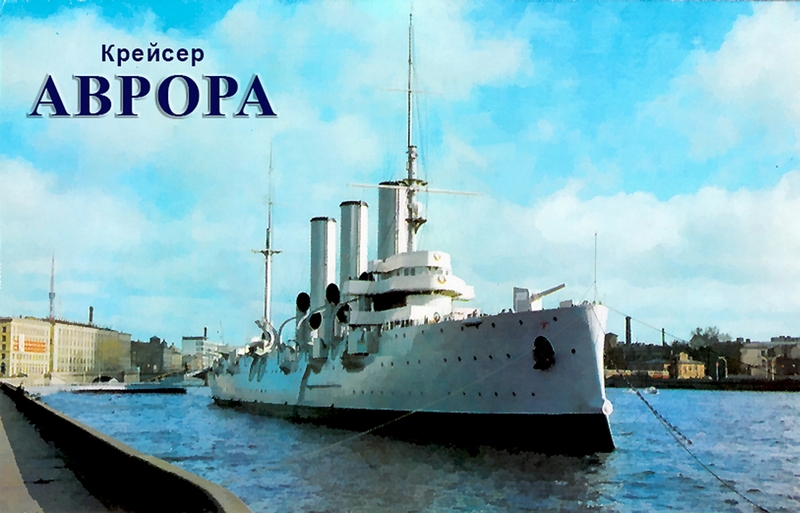 A digital image of the Tsarist-era Russian Navy cruiser Aurora (Russian: Аврoра) which served as an iconic symbol of the October 1917 Bolshevik Revolution, moored in the Neva River at St. Petersburg, Russia. The Aurora’s keel was laid down at the “New Admiralty” shipyard in St.Petersburg on 23 May 1897. She was one of three Pallarda-class cruisers, built for service in the Pacific Far East. All three ships of this class served during the Russo-Japanese War. The cruiser was launched on 11 May 1900 and joined the Navy of Russia in July 1903. The ship measures 126.8 meters (418 feet 5 inches) in length, 16.8 meters (55 feet 5 inches) in width and weighs a staggering 7,600 tons. Maintaining a speed of 20 knots (23.3 miles per hour) it can travel independently for up to 1,440 sea miles. Soon after entering service, in November 1903, Aurora was ordered to sail with a group of reinforcements to the Russian Pacific Fleet. However, she suffered from repeated mechanical failures and had to be repaired at several ports along the way. When word was received of the start of the Russo-Japanese War while at Djibouti, she was detached from the reinforcement fleet and sent back to the Baltic. After refitting, Aurora was ordered back to Asia as part of the Russian 2nd Pacific Squadron, a collection formed from the Russian Baltic Fleet, under the command of Vice-Admiral Zinovy Rozhestvenski. On the way to the Far East, Aurora was involved in the Dogger Bank incident when Russian vessels mistook British trawlers for Japanese warships in the North Sea and fired on them. Russian vessels also fired on each other. The Aurora sustained slight damage during this incident and her captain was killed. The crew used part of the Aurora’s penetrated armor to frame Captain Yegoryev’s photograph. On 27 and 28 May (May 14–15 in the Julian calendar then in used by Russia) 1905, Aurora took part in the Battle of Tsushima Strait (between Korea and southern Japan), along with the rest of the Russian squadron. During the battle, her captain, Captain 1st rank Eugene R. Yegoryev was killed, along with 14 crewmen. The executive officer, Captain 2nd rank Arkadiy Konstantinovich Nebolsine, though wounded himself took command. After that Aurora, covering other, much slower Russian vessels, became the flagship of Rear-Admiral Oskar Enkvist, and with two other Russian cruisers broke through to neutral Manila, where she was interned by American authorities from June 6, 1905 until the end of the war. In 1906, Aurora returned to the Baltic to become a cadet training ship. From 1906 until 1912 the cruiser visited many foreign ports; in November 1911 the ship was in Bangkok as part of the celebrations in honoring the newly-crowned King of Siam. During World War I Aurora operated in the Baltic Sea performing patrols and shore bombardment tasks. In 1915, her armament was changed to fourteen 152 mm (6 in) guns. At the end of 1916, she was moved to Petrograd (renamed St. Petersburg) for major overhaul. The city was brimming with revolutionary ferment and part of her crew joined the 1917 February Revolution. A revolutionary committee was created on the ship, with Aleksandr Belyshev elected as captain. 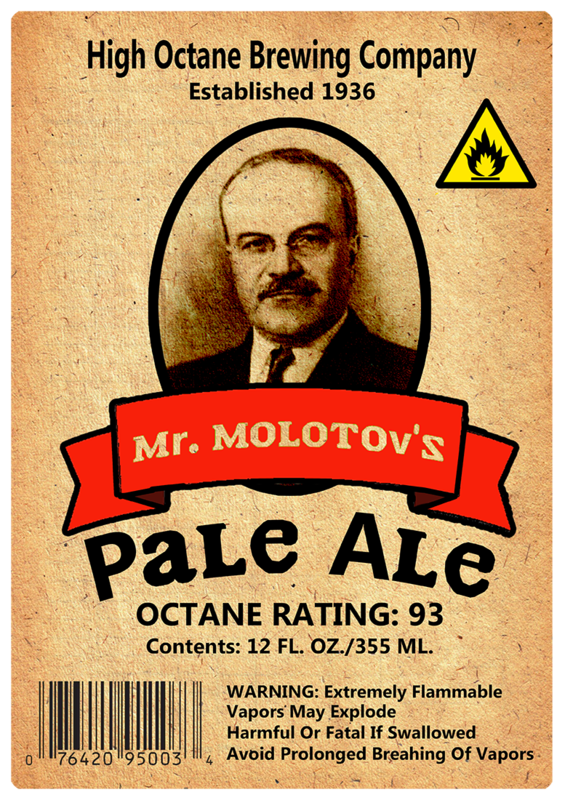 Most of the crew joined the Bolsheviks, who were preparing for a Communist revolution. At 9.45 p.m on 25 October 1917 (Old Style – Julian calendar) a blank shot from her forecastle gun signaled the start of the assault on the Winter Palace (then the residence of the Provisional Government), signaling the beginning of the October Revolution. In summer 1918, she was relocated to Kronstadt and placed into reserve. In 1922, Aurora was brought to service again as a training vessel. Assigned to the Baltic Fleet, from 1923, she repeatedly visited the Baltic Sea countries, including Norway in 1924, 1925, 1928 and 1930, Germany in 1929 and Sweden in 1925 and 1928. Until 1940 students of Naval colleges did practical work on the cruiser. The Aurora again visited several foreign ports. In 1924 the cruiser was awarded the Red Banner of the USSR Central Committee and in 1927 decorated with the order of Red Banner. During the Second World War, the guns were taken from the ship and used in the land defense of Leningrad. During the siege (1941-44) the Aurora was moored at a pier in the Oranienbaum port (the town of Lomonosov) . Constantly shelled and bombed the hull was holed, and Aurora on September 30, 1941. In July 1944 the ship was raised and taken into a dock for repair. The ship herself was docked at Oranienbaum, and was repeatedly shelled and bombed. In 1948 the Aurora was moored at the Petrogradskaya embankment of Leningrad and served as a training vessel until 1956 when she became a museum (a branch of the Central Naval Museum). Over the years since the Aurora been visited by more than 28 million people from 160 countries. In 1968 the Aurora was decorated with the Order of the October Revolution. In July 1992 the Saint Andrew Naval Banner – the symbol of Russian naval power – was raised over the ship again. In January, 2013, Russian Defence Minister Sergei Shoygu announced plans to recommission Aurora and make it the symbol of the Russian Navy due to its historical and cultural importance.